Join us on 15th September 2019 for the first ever SNAPS Superhero Zoom! 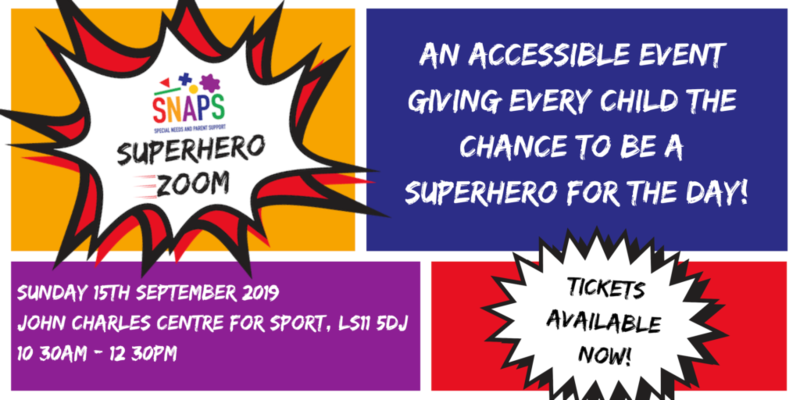 The SNAPS Superhero Zoom is an accessible event for all children, because we believe every child deserves to feel like a superhero for the day. Taking place at the John Charles Centre for Sport in South Leeds, the event is an opportunity for children to wheel, walk, run and zoom their way around the athletics track. No matter what your child’s ability, they can take part in this event and become a superhero. The venue is accessible for wheelchair and walker users and in a safe environment for children. All children taking part will need a ticket each – parents and carers go free! Early bird tickets are available now but are limited, so don’t miss out! All proceeds from the event will support SNAPS Yorkshire CIO. If you have any questions or would like to know more about the event, please contact jenny@snapsyorkshire.org.